A stunningingly beautiful day in February 2009. All around me the ice had been sculpted by wind into fascinating patterns and shapes. Red Tarn, below Swirral Edge, was frozen solid. I found it extremely slippery on the edge and quickly realised that I should really have worn crampons. 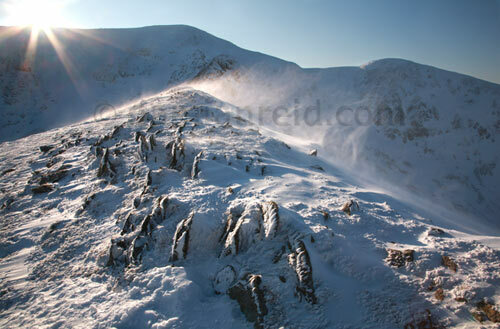 I hand held the camera for this shot in a strong, biting wind as the sun lowered towards Helvellyn summit. "